Some have commented on a note that was caught in a police photograph after law enforcement breached the door of Stephen Paddock’s suite on the 32nd floor of the Mandalay Bay Resort and Casino. 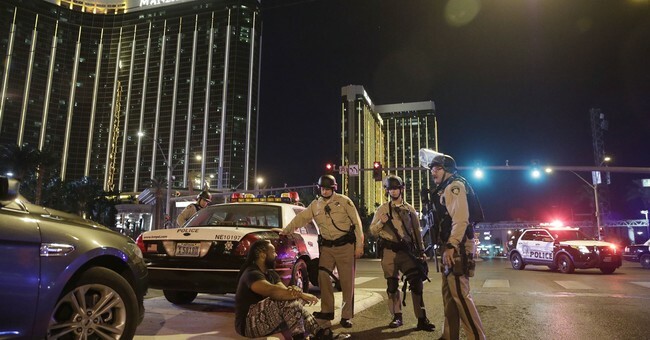 The 64-year-old used his room as a vantage point to open fire upon the 22,000 concertgoers attending the final night of the Route 91 Harvest festival. He killed 58 people. He wounded at least 400+ more. It was a senseless attack and one in which we don’t know the motive. He was independently wealthy, a heavy gambler, with no known mental health history, or any run-ins with the law. He purchased all of his firearms legally. He passed background checks. A note found in the hotel room of the man who shot into a crowd from his perch in a Las Vegas high-rise included hand-written calculations about where he needed to aim to maximize his accuracy and kill as many people as possible. In an interview airing Sunday on "60 Minutes," three police officers who stormed Stephen Paddock's hotel room in the Mandalay Bay hotel tell correspondent Bill Whitaker new details about the deadliest mass shooting in modern American history. The officers were the first to see Paddock's body and the arsenal of weapons and ammunition he had stockpiled. Officer David Newton from the Las Vegas Police Department's K-9 unit said he noticed a note on the shooter's nightstand once officers breached the room. He said the note was located near one of the windows that Paddock had smashed with a hammer to fire onto the crowd below with high-powered semi-automatic rifles outfitted to increase their rate of fire.